In February and March 1997 three young girls were attacked in Kobe, Japan. On 15 March ten-year-old Ayaka Yamashita was bludgeoned to death with a steel pipe in the same area. 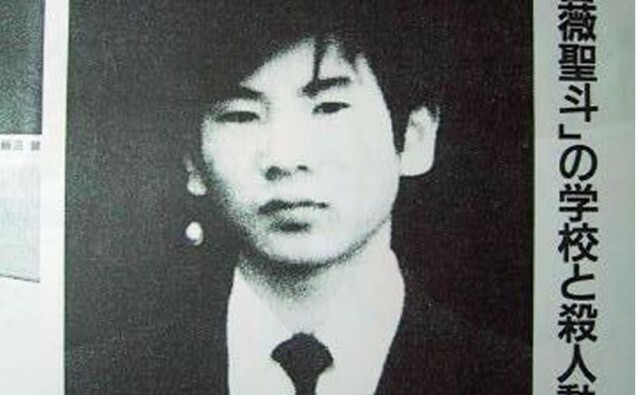 On 27 May 1997, some time before pupils were due to arrive at Tainohata Elementary School, the caretaker found the head of 11-year-old Jun Hase, who had been missing for three days, in front of the school gate. He had been decapitated with a handsaw and in his mouth was a note in red ink reading, “This is the beginning of the game… You police guys stop me if you can… I desperately want to see people die, it is a thrill for me to commit murder. 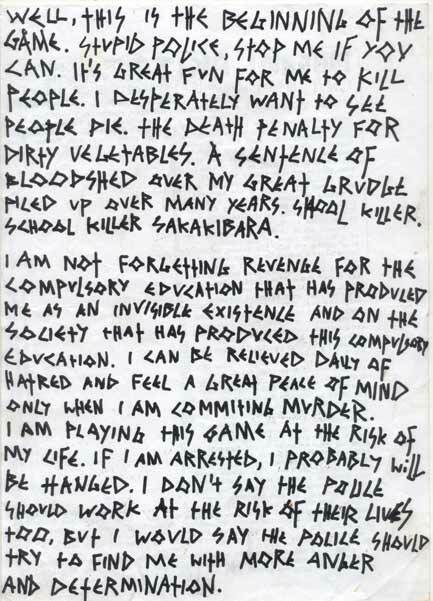 A bloody judgement is needed for my years of great bitterness.” It was signed The School Killer. Later the same day the rest of the boy was found under a house in the woods near the school. The killer also wrote a symbol similar to one used in San Francisco by the Zodiac. Near most of the crime scenes were the mutilated bodies of cats. On 28 June 1997 a 14-year-old boy was arrested for the murders and assaults. He had begun mutilating animals when he was 12 (he would line up frogs and then cycle over them) and started carrying knives when in junior school. He had kept a diary detailing his exploits and in his bedroom police found thousands of comics and pornographic videos. Japanese law at the time meant that no one under 16 could be charged as an adult so he was sent to a reformatory for treatment. In 2003 he was pronounced cured and paroled on 10 March 2004, aged 21. His supervised parole ended on 31 December 2004 and he is now free, with a new identity.